Kew Gardens has been welcoming visitors through its gates since 1840, when it was founded from the exotic garden at Kew Park. A breathtaking botanical garden with thousands of plants species under spectacular victorian glasshouses, Kew Gardens is an oasis of green perched on the Thames riverside. Whether you're an enthusiastic horticulturist or a family looking for a magical place to spend a day in the sun, Kew has attractions all year round. For more than two-and-a-half centuries, the Royal Botanical Gardens at Kew have been inspiring some of the most noteworthy poets, authors and artists to create beauty in their works. Many of the UKs most prolific writers and painters have spent days in the Royal Botanical Gardens inspired by nature and educated by the hard work of those seeking to explore plant life and fungi, of which there are literally tens of thousands of species here. Today you can take advantage of the loveliness of the Royal Botanical Gardens at Kew while enjoying lovely savings from vouchercloud. From saving on entry, special events and access to the amazing libraries, there are many ways you can enjoy the best of Kew on a budget. 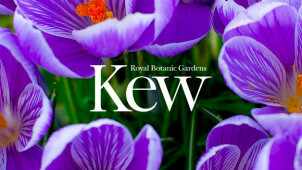 How do I use my Kew Gardens discount code? On vouchercloud you will find various offers throughout the year for Kew Gardens. The top vouchercloud saving tip would be to take advantage of deals we have listed in conjunction with the seasonal membership. You can’t beat that in price! What time does Kew Gardens open? Throughout the year, Kew Gardens opens at 10 AM and only closing times are seasonally affected. Does Kew Gardens have disabled access? Yes, and as a matter of fact, Kew Gardens is quite proud of the advances they have made in accessibility throughout the park. Does Kew Gardens offer free entry for kids? Yes, children aged three or under are free with an adult. Does Kew Gardens offer a discount for students? Student tickets are offered under ‘Concession’ ticket pricing that is the same as disabled and senior rates. The best savings for students may be to check out group rates to visit Kew Gardens with a school group. Gardens close at 5:30pm, last entry is at 5pm. There are some seasonal closures and restoration work going on throughout the year - any days that are affected will be pointed out on the Visitor Notices page. Visitor Notices page. London's largest UNESCO World Heritage Site, Kew Gardens is a must-visit should you take a trip to the capital. From the blossom in spring to the Christmas lights in winter, Kew is a buzzing hive of activity that is gorgeous all year round. Save on your trip by selecting a Kew Gardens discount code to save on your booking and revel in the beauty of nature for less. By making some smart savings, you might even be able to treat yourself to lunch in Richmond after your visit! Not only can you explore some of nature’s most exquisite botanical delights at Kew Gardens in London but the sister garden at Wakehurst has similar offerings and learning experiences in a different part of the country. If you can’t make it to the capital, don’t despair — spend a day in the Royal Botanical Gardens at Wakehurst. Walk, learn, meditate or simply breathe in your surroundings - what a way to refresh in the midst of the chaos of everyday life! Start your wholesome adventure by investing in a Kew Gardens membership; it offers excellent value for money and grants free entry to both locations. Look out for our Kew Gardens vouchers to save on the annual fee and give as a gift to loved ones or yourself to explore this magical garden over and over again. A beautiful attraction all year round, you'll discover something new with every visit!